"More than peace of mind"
Increasingly we rely more and more upon our computers to run our businesses and hold all our essential information. It's time to realise that it is no longer suitable for you to be relying upon local clumsy tape and disc backup systems to secure your data. Often when called upon to recover the data from these sources it is corrupt and takes days to bring your business back on line with much information lost in the process. Yourhub offers Online Backup services to many businesses. Backup your data securely, automatically and reliably to protect your computers and business against any disaster. 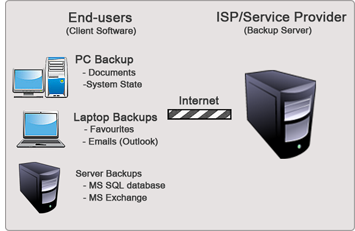 Yourhub offers data backup services for Windows, Macintosh and Linux systems for personal computers, laptops or servers online. Yourhub online backup services means that all your important data is backed up on our secure servers away from your office and is scheduled to backup at time intervals that suit you, and includes a backup reporting system. Automatically schedule preferred backup time. Data Encryption through SSL authentication and AES 128/256 bits technology. 24x7 availability of your data through internet to any location. Choose a Storedata package that suits you needs. For Other Business Plans: Click here. Dont want to sign up online? That's ok download our application form right here.